Recently we updated all Stickyworld portals to our latest release, 1.25. In this post we'll go through the list of features that have been added. We have added an option in the room configuration to allow for private conversation rooms. This new response visibility option means that participants will only see their own conversations with organisers of the rooms. This allows organisers to use one room to communicate with several participants in private, opening the opportunity for Stickyworld to be used as sales rooms. The participants do not see each others responses, but the organisers can see and reply to any participant responses. Due to the nature of this response visibility setting, moderation does not apply, additionally the organisers are not able to post comments themselves, they can only reply to existing comments added by participants. You can now change the page name and page ordering within rooms. We have listened to feedback where people thought that SLIDES was not really appropriate for the type of content they were showing. Well, now if you are completely free to change the page names to suit your activity. 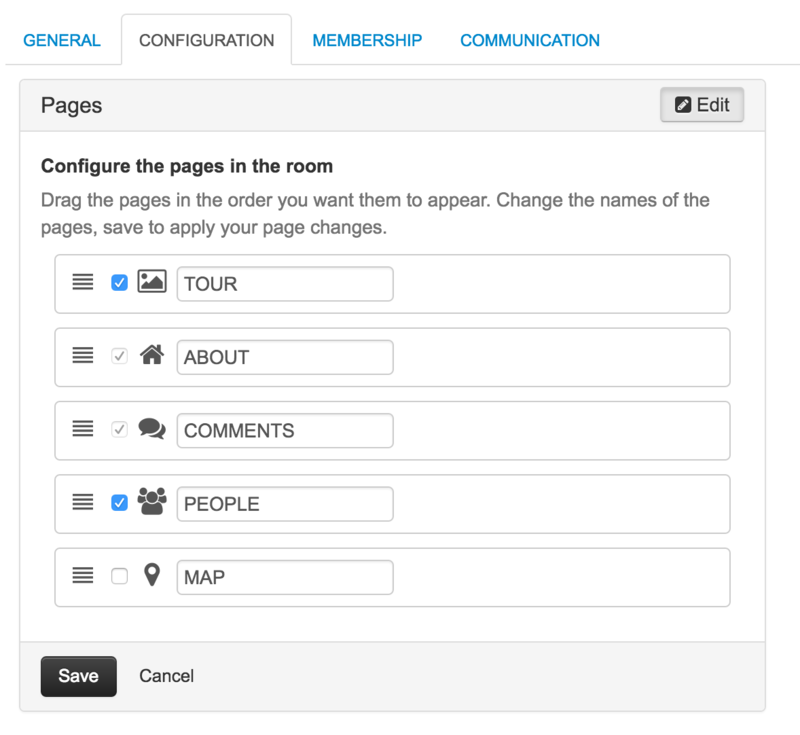 As an organiser in a room, simply click the Organise button and choose the Configuration tab. Then click the Edit link, from here you can name the pages whatever you like and even drag the handle to change the page order. And as usual, you can enable or disable pages using the checkboxes. We identified that having the slide categories in a dropdown meant they were not that visible or accessible. So instead, desktop browsers will see the categories expanded into a horizontal pills-style. Being able to see all the categories is a big improvement. To make more use of the horizontal space, we have moved the note filter dropdown that was on the right hand side, into the organiser dropdown menu to give the entire horizontal space over the categories. So if you need to see links on a slide or all the info notes, you will need to use the Organiser dropdown on the Slides page. Mobile views which are limited on horizontal space will still use a dropdown style category browser. Info notes now support attaching images in the same way as comments and replies do. This should result in more useful contextual information notes where visuals help present the information. Previously you may have gone about presenting visual information by linking to another slide to show the image, now you have an alternative which won't increase the number of slides in your room. 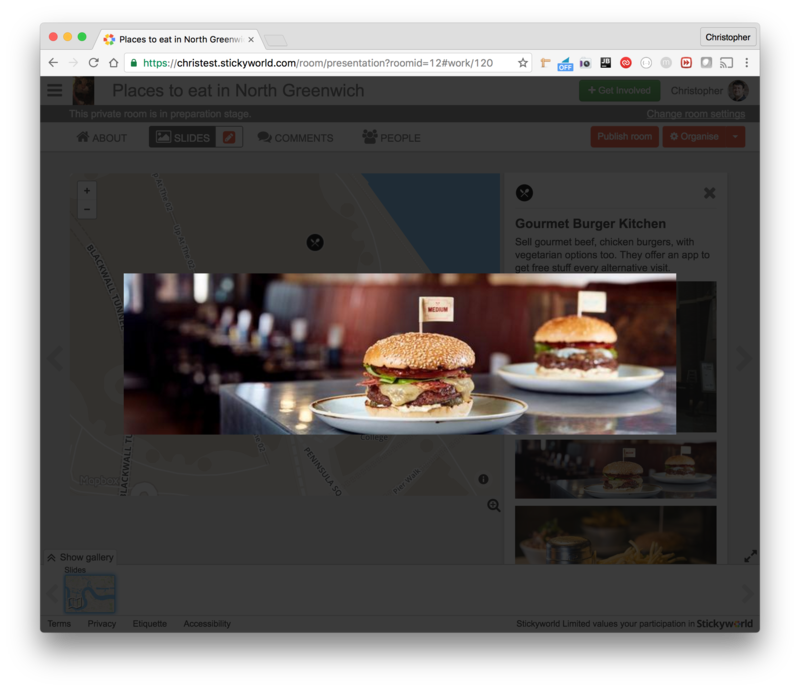 We have also added a feature for all attached images where clicking on them expands to a lightbox style view. As well as attached images, info notes now also support attaching locations. This means you can make full use of your map pages to present additional information to your visitors. We have also ensured that map slides and responses added to map slides are automatically tagged with a location so these will in future automatically show up on the map page. You can remove the attached location as usual by editing and removing the location if you don't want it to show up on the map page. 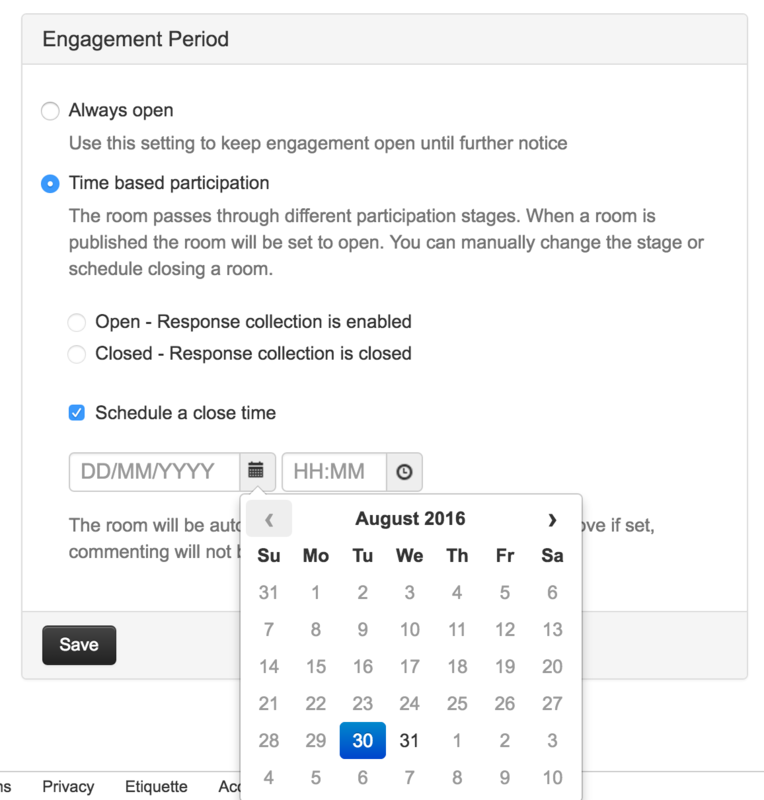 A big feature in this release is the addition of time based participation in rooms. When you create a room, or configure an existing room you have the option to use specify a closing date and time. This date will be advertised in a new status bar that has been added near the top of all rooms, which tells participants how long they have left to participate before the room closes. When a room has closed, it is still viewable by participants but will not allow for any more responses. Related to the closing date change described above, you may notice some changes to the room configuration interface in the room. On clicking the Organise button there are several panels describing different settings of the room. We have also added information tooltips to describe each of the settings. These modular settings should present the options for configuring the room more clearly. 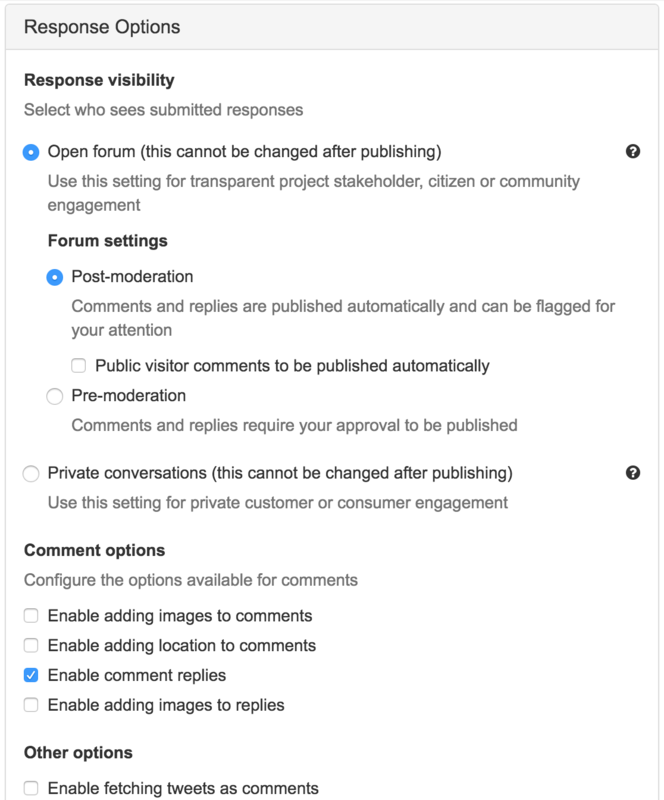 We have moved the commenting options that were previously in the page configuration under a Response options panel, which now includes the new response visibility option Private Conversations, moderation options and the comment options. Additionally there is an extra option to turn off comment replies. If you don't want to have threaded discussions with replies this can now be achieved by disabling comment replies. There are 2 new fields Objective and Conclusion that are only visible for organisers. 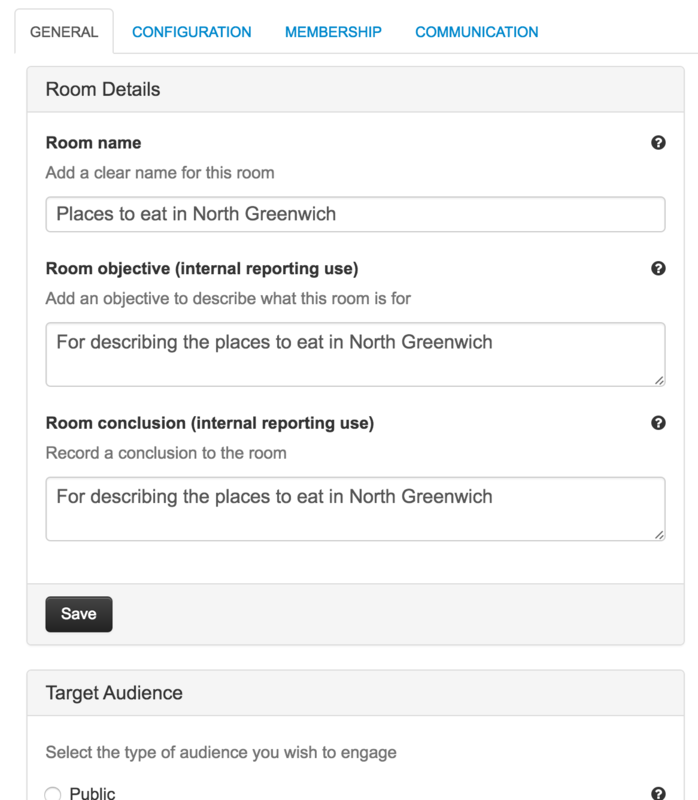 Use the objective field to keep track of what you are trying to achieve through your participants engaging with this room. Use the conclusion field for recording any outcomes from the engagement activity. Remember these fields are private available for the organisers only. In future releases these fields may be included in reports. Organisers will also note a Publish button appearing next to the Organise button. Rooms are in preparation state until they are published. Rooms in preparation status are indicated by a grey room status bar. Preparation status rooms are only accessible by organisers from the Manage rooms page. They are open to participants either when the room is directly published, or the first participant invite is sent. When the Publish button is clicked there is a page presented which describes what steps need to be completed before the room can be published. This is a final opportunity to review everything before publishing and opening the room. As well as several bug fixes, we have added some other minor improvements. You can press the escape key on the keyboard to cancel comment creation. How it works link now shows a full page modal with relevant text based on the chosen room settings. Stickers now appear ghosted when they are are not the active selection, previously unselected stickers were hidden completely. As you can see, 1.25 is quite a big release with lots of features. We hope you enjoy trying them out and let us know what you think.